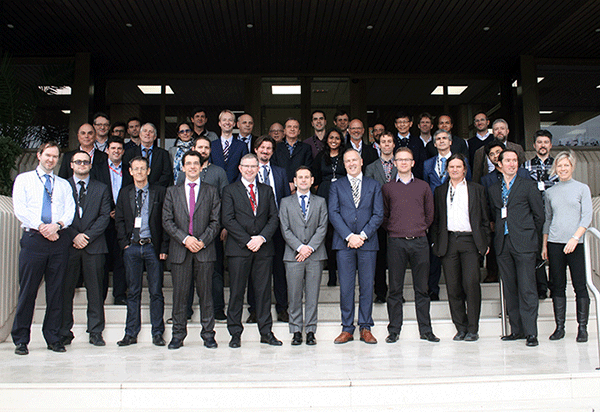 On 1 and 2 February GMV has hosted the biggest ever meeting of space robotics experts as part of the European Commission’s Strategic Research Cluster which is coordinated by project PERASPERA (Latin meaning “Through hardships to the stars”). The project is being coordinated by the European Space Agency (ESA) and the partners are the Italian Space Agency (Agenzia Spaziale Italiana: ASI), Spain’s Industrial Technology Development Center (Centro para el Desarrollo Tecnológico Industrial: CDTI), the French Space Studies Center (Centre National d’Etudes Spatiales: CNES), the German Aerospace Center (Deutsches Zentrum für Luft- und Raumfahrt: DLR) and the UK Space Agency (UKSA). Funded under the European Union’s Framework Research and Innovation Program, Horizon 2020 (H2020), considered to be the most ambitious research and innovation program ever set in motion by the EU, the project’s main aim is to develop and promote the main space robotics technologies ahead of future technology demonstration missions. In the first phases of the Cluster, working with an estimated budget of 22 million euros for the 2015-2018 period, about 30 European institutions employing about one hundred space-robotics experts and technicians will develop six technology building blocks to serve as the basis for future orbital and surface missions. Four of them are being led by Spanish firms and three by GMV, thus confirming its status as a worldwide expert in the development and ground validation of space-robotics technologies. GMV will specifically be taking on responsibility for the European Space Robotics Control and Operating System (ESROCOS project); the European Robotic Goal-Oriented Autonomous Controller (ERGO project); plus the Facilities for Testing Orbital and Surface Robotics Building Blocks (FACILITATORS project), which will validate the developed technologies in highly representative space environments. One of the main milestones in this first stage of the program is the revision of the requirements of the six technology building blocks, addressed in a meeting of over 60 space-robotics experts in GMV’s head office. This meeting, specifically, has agreed on the features and scope of the robotics system developed within the cluster: operating system, autonomy system, data fusion system, sensor system, the mechanical interface and the facilities and robots where the various technologies will be validated. In 2018 the objective of the PERASPERA roadmap is to make a start on integration of the technologies developed in the first phase, doing so in a series of activities applied to planetary and orbital scenarios. After these activities next calls will be dedicated to the feasibility studies of the In Orbit Demonstration (IOD) missions to be implemented in future program stages and beyond the H2020 program. The results obtained in said blocks will therefore be crucial for future space-robotics developments.